The screen is very touch sensitive. DO NOT press on the screen with a lot of pressure. Simply touch or tap on the screen with a finger. Don’t be afraid to touch the screen you won’t hurt it! *NOTE: Touch screen has a 10 minute time out feature. If the screen hasn’t been touched in 10 minutes, it will return to Home Screen and the backlighting will dim. Just touch anywhere on the screen and it will light back up. Please read this manual in its entirety to familiarize yourself with ALL the operations, before you begin operations of the sauna. If you have any questions or problems with the operation of the MPS Touch View touch screen control, after reading this entire manual in entirety please call customer service at: 866-998-0148 and a customer service associate will assist you. After reading this manual entirely, please plug in your sauna. On your MPS Touch View touch screen control should be the Home Screen. In the upper right side of this screen and every other screen you will see there are these 2 icons. One icon for the light controls and the other icon for the audio controls. Pressing the plus or the minus signs will either brighten or dim the light. For the audio it either increases or decreases the volume. This also increases or decreases the loudness of the Beep you hear when a button is pressed. Touch this option on the screen and you will enter the USE NOW screen. On the USE NOW screen, you can set your timer and your temperature to use now. By touching this option on the screen, you will enter the SET-UP screen. In this screen, you will be able to set-up all of your different programs. Clock, MPS, Pre Heat, Audio and 7 Day Programmable programs found here. When you have set up the AUTO-RUN 1 program, you must touch this option on the screen to activate that program. When activated the pad will turn green. If you do not wish to run this program after you have started, touch on the screen and it will turn blank. Same as above option AUTO RUN 1. *NOTE: Whenever you see the Home Screen, the sauna is OFF. From the HOME SCREEN, touch the SET UP pad. You now see several set up options. Let’s get started by setting your clock. With the clock being set up first, you can use your sauna shortly. We will return to the SET-UP screen later on. *NOTE: Whenever the SAVE pad is touched you will go to the HOME screen. To continue your set up options you must touch SET UP to re-enter the set up screen. From the HOME screen, touch the SET-UP pad. Now you are in the SET-UP screen, where you are able to set up various programs. Touch the SET-UP CLOCK pad. Touch up or down arrows to adjust. Touch the + (plus) and – (minus) signs to adjust. Once the number hits 0 (zero) or 11 (eleven) you must reverse your buttons. AM or PM will change when you pass the 12pm hour. Touch the + (plus) and – (minus) signs to adjust. When the number hits 59 or 0 (zero) you must reverse buttons. Touch either F or C for the one you want. 12 hour time is used for standard time, and 24 hour time is used for military time. Touch whichever one you want to use. You MUST touch SAVE on the screen to save all of your settings. Once SAVE is touched you will return to the HOME screen. *NOTE: Every time you touch the SAVE pad on the screen, no matter what screen you are in, you will return to the HOME screen. Sauna should be set at 125 degrees and run for 60 minutes before initial sauna session. This only has to be done once. This option if touched on the HOME screen will bring you to the above screen. You would touch this option if you are ready to use immediately. Touch the + (plus) or – (minus) signs to increase or decrease the temperature. This option lets you set the amount of time you want your sauna session to last. Touch the + (plus) or – (minus) signs to increase or decrease the length of time. This option has 3 settings. The + (plus) sign moves you from OFF to WAVE to MPS. The – (minus) sign takes you back to OFF. This option if touched will start your sauna session. You would touch this to allow your sauna to start up. Enjoy your new healthier body! If at any time you want to exit a program or shut the sauna off, you would touch this option on the screen. It will return you to the HOME screen. *NOTE: OFF= Full power to all theramitters. MPS= Micron Power Select: selecting the percent of power per heater. WAVE= Fluctuating micron levels per heater, moving from one to another. This screen is a graphic illustration on how your different zones are working. It shows current and set temperatures and elapsed time left. By touching the ADJUST pad you can re-adjust your time and temperature settings. 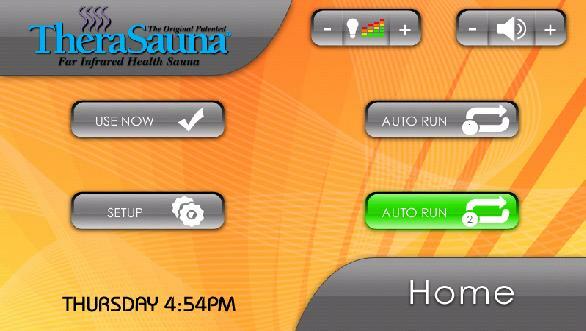 When done adjusting, press the ZONES pad on the screen and your sauna graphic (shown above) will reappear. Touch the HOME pad on the screen and the sauna will shut off and you will return to the HOME screen. On the left side of the screen, you should see a graphic image of your sauna. The circled numbers represent each heater zone in the sauna. These numbers will correspond with the zone numbers on the right side of the screen. To adjust the micron level of each zone from 100% (highest) to 7% (lowest) touch the + (plus) sign to increase, - (minus) sign to decrease. After adjusting ALL of your sauna’s zones, you must touch the SAVE pad on the screen to save the settings. Touching this option will return you to the HOME screen. To return back to the SETUP screen, touch the SETTINGS option on the HOME screen. This option if pressed on the screen will reset your settings back to the factory default settings. The clock WILL NOT reset. This option when touched on the screen will preheat your sauna to 100 degrees Fahrenheit if selected, and hold that temperature for as long as the PREHEAT mode is on. When you see this screen, the Preheat mode has already been activated and is on. To cancel PREHEAT, touch the HOME pad on the screen. Touching the START pad on the screen while in The PREHEAT screen will take you to the USE NOW screen and also cancel the PREHEAT program. To use, make your setting adjustments and start your sauna. When session times out, the HOME screen will appear. Touch this option on the screen and you will go to the AUDIO screen (shown above). In this screen, you will find 6 peaceful, relaxing sounds to help you get the full therapeutic session of your TheraSauna. Make your choice of sound and remember to touch SAVE on the screen to save your choice. Touching SAVE will return you to the HOME screen. When AUDIO sound is on, the sounds will play even when the sauna is off. In this screen option, you can program your TheraSauna Start times for seven days a week. You can only program 1(one) start time per day in each Auto Run program. On the left side of the screen you will see 5 categories to choose from. Touch the category you want to set. Then, use the + (plus) or – (minus) signs on the value pad to adjust. Once you have completed the settings, touch the corresponding Day of Week pad on the right side of the screen to activate that day. The pad will turn green when activated. Do this for every day of the week you want set. You MUST touch the SAVE button to save the entire weeks settings. This also will return you to the HOME screen. When back at HOME screen, you must touch the AUTO RUN 1 or 2 pad to activate the program to run. When activated, this pad will turn green. The reset pad in the Auto Run Program will reset your settings back to the last saved settings. *NOTE: If you do not want the Auto Run program to run on a certain day touch that days pad and it will go from green (on) to grey (off) then touch SAVE to keep the change. HOME will always take you to the HOME screen but will not save any information. HOME also shuts sauna off. 1. Heater will not heat. 1. Check the MPS settings to be sure that the heater is set higher than 7%. 2. Check plug in connection at main control box behind the sauna. 3. Check the extension cords in the roof. 4. Check connections at the heater box. 2. Touch Screen turned black or locked up. 1. Unplug sauna for 20 seconds and plug back in. All your settings will be saved. 1. Read and write down all the information. 2. Unplug unit and plug back in after 20 seconds. If after reading this entire manual you require assistance, please call our Customer Service Department at (866) 998-0148. You must have your serial number, Date of Purchase and Place of Purchase information ready for quick reference. Our technicians cannot help you without this information.